• High pressure oxygen/inert gas mixture tables used in selected and/or refractory cases. 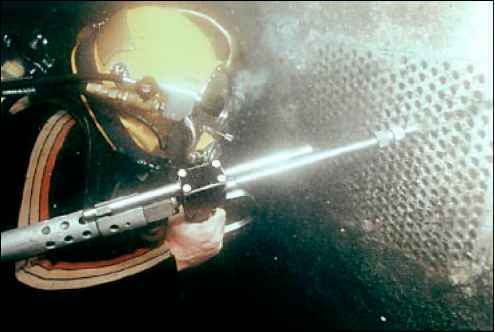 Deep, mixed gas or saturation diving require special treatment protocols. • Recompression and rehabilitation is recommended until no further significant improvement is observed. • Implementing a coordinated network for the collection and the retrospective analysis of data concerning decompression accidents. • training in the recognition of signs and symptoms of decompression accidents. One hundred percent oxygen should be administered immediately to all diving casualties; it is the single most important first aid treatment for surface-oriented diving. Appropriate rehydration is an important adjunctive first aid measure. First aid measures should not delay or defer definitive treatment. o depressed level of consciousness or loss of airway control o nausea and vomiting o suspected illness or injury of the gastro-intestinal tract This should be done with non-carbonated, non-caffeinated, isotonic fluids or drinking water if this is all that is available. If the patient is hyperthermic, the liquid should be cooled. High glucose content is not recommended. The amount of fluid should be adapted to the patient's thirst and willingness to take them. • Intravenous rehydration: preferred if a trained healthcare professional is available. Access should preferably be via 18 gauge catheter with Ringer's Lactate or Saline as the infusion fluid. Glucose containing solutions are not recommended. Colloids can be considered if large quantities of fluids are needed. Recommended colloids, in order of preference, are starch-containing solutions, gelatines, and haptene added dextranes. • urinary output, hemodynamics, CVP, standard laboratory tests should be performed. • The administration of normobaric oxygen allows for the treatment of hypoxemia and favors the elimination of inert gas bubbles. • Oxygen should be administered with an oro-nasal mask with reservoir bag, at a minimal flow rate of 15 L.p.m., or CPAP mask and circuit, using either a free flow regulator or a demand valve, in such a way as to obtain a FiO2 close to 1. • In case of respiratory distress, severe shock or coma, the patient should be intubated and ventilated with a FiO2 = 1 with settings to prevent pulmonary barotrauma. Normobaric oxygen should be continued until hyperbaric recompression is started (with a maximum of 6 hours when the FiO2 is 1). Resuscitation Drugs and DVT Prophylaxis (Recommended).